Kirsten Johnson joined The Philadelphia Orchestra as associate principal viola at the start of the 2007-08 season. She made her solo debut with the Chicago Symphony at the age of 17 and has since performed with many orchestras, including the Oberlin Chamber Orchestra, the Concertante Chamber Ensemble, and the Juilliard, Jackson, Kalamazoo, and Peninsula symphonies. 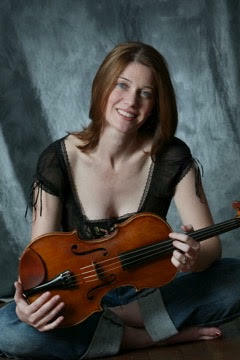 She has participated in chamber music festivals nationwide, performing at Bargemusic, the Caramoor International Music Festival, The Chamber Music Society of Lincoln Center, the Santa Fe Chamber Music Festival, the Bridgehampton Chamber Music Festival, the Cape & Islands Chamber Music Festival, the Pensacola Chamber Music Festival, the Spoleto Festival, and Bay Chamber concerts. She participated at the Marlboro Music Festival for three summers and continues to perform on Music from Marlboro tours. As a chamber musician she has appeared in performances with the Orion, Vermeer, St. Lawrence, and Colorado string quartets. A first-prize winner of the 1997 Washington International Competition, she has recently appeared in recital engagements on the Kohl Mansion Chamber Music Series near San Francisco, the concert series at the Phillips Collection in Washington DC, the Dame Myra Hess Memorial Concerts series in Chicago, and the St. Croix Concert Series in Stillwater, Minnesota. Ms. Johnson received her bachelor’s degree from The Curtis Institute of Music, where she studied with Michael Tree. She pursued further studies with Samuel Rhodes at The Juilliard School. Her other teachers include Almita and Roland Vamos and James Dunham.